In a time of frequent reports of terrorism, it appears that the threat of terror-related incidents is present in the thoughts of many European citizens. In fact, 25 percent of those residing in the EU perceived terrorism to be the most important issue facing the EU in 2015. However, in light of the most recent incidents, it appears that fear has increased. In 2017, for example, almost 65 percent of Italians reported being somewhat worried about an attack. In the UK the perceived threat of a terrorist attack was considerably high in 2016, and the same perception of risk was detected in Germany. The European continent has seen an increase of Islamic terrorist activity since 2014. That year, Europe suffered from 290 terrorist attacks. In 2016, there were 363 terrorist attacks reported in Turkey with 139 people killed, making it the most affected country in Europe. Considering just 2017, the largest loss of life was recorded on May 22, 2017 in Manchester, UK, whereby 22 men, women and children were killed. According to the Global Terrorism Index 2016, an index that systematically ranks countries of the world according to their terrorist activity, Turkey ranked 14th with a score of 9.74 points. The index also includes, among European countries, France, the United Kingdom, Germany, Greece and Sweden. 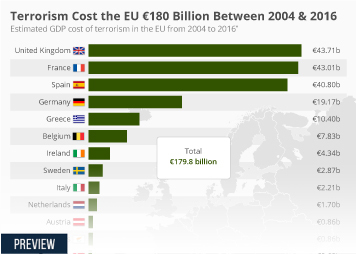 Between 2014 and 2017, France has been a critical target within Europe, with a major terrorist attack in November 2015 in Paris. Also the United Kingdom witnessed an increase in terrorist activity in 2017, with three major attacks. Other notable targets in Europe have included Germany, Belgium and Spain. Different countries have different levels of trust in counter-terrorism actions. For example, 27 percent of Swedish people trusted at least to some extent the government's ability prevent terror attacks, while the figure jumped to almost 65 percent in terms of Italians trusting the intelligence services for the prevention of possible attacks in their country. 32 percent of Germans believed terrorism should be opposed on a global level, and the same idea was detected among Spanish and French citizens. It is interesting to notice the impact of terrorism on everyday life and general planning. For example, in the European Union overall 5 percent of holidaymakers changed their travel plans or destinations due to terrorist attacks or terrorist threats in 2015. In Italy, 15 percent of respondents claimed to avoid travelling in risk zones, and a smaller group even avoided travelling in general. In 2016, 28 percent of UK residents said they would postpone holiday travel booking until they felt comfortable about security.